It hasn’t been very long since the most recent barrage of iPhone rumours. However, the latest round of iPhone reports and musings are a bit more exciting, with word about the iPhone SE getting a reboot for 2019, a patented nanoparticle coating that could increase iPhone durability, and even a die shrink for Apple’s A-series chip coming in 2020. Let’s dig in. Coming from PC-Tablet.com, the biggest and most tantalising report is a possible reboot of the iPhone SE, which originally launched three years ago in the spring of 2016. However, for 2019 it seems the iPhone SE will get a name change to the iPhone XE, which would fall in line with the rest of Apple’s existing iPhone lineup such as iPhone XS, iPhone XS Max, and iPhone XR. Alongside a new name, the iPhone XE will also reportedly be getting a 4.8-inch edge-to-edge AMOLED display similar to what you find on current iPhones, with a smallish notch up top for Apple’s FaceID sensors and a selfie cam or two. Other rumoured iPhone XE specs include a single rear camera and an aluminium unibody chassis instead of glass. However, the use of metal means the iPhone XE probably won’t have support for wireless charging, and in order to maximise the XE’s screen real estate and avoid doubling up on biometric tech, unlike the iPhone SE, it seems the XE won’t get a Touch ID sensor either. While some media and insiders have expressed some doubt about the report’s sourcing, here’s hoping this rumour isn’t a ruse. I’ve been saying for a while now that a less expensive iPhone SE-sized device with updated components and a bezel-less screen is something Apple really needs, and based on the excitement over the recent availability of refurbished iPhone SEs in the US, clearly there’s demand for a refreshed small-screened option in the iPhone family. And with US prices for the iPhone XE expected to start at around $600 (£459), the XE would also be even more affordable than the £750 iPhone XR. Aside from the iPhone XE, it seems Apple is also working on a new nanoparticle coating for the iPhones, MacBooks and other Apple devices designed to increase durability. 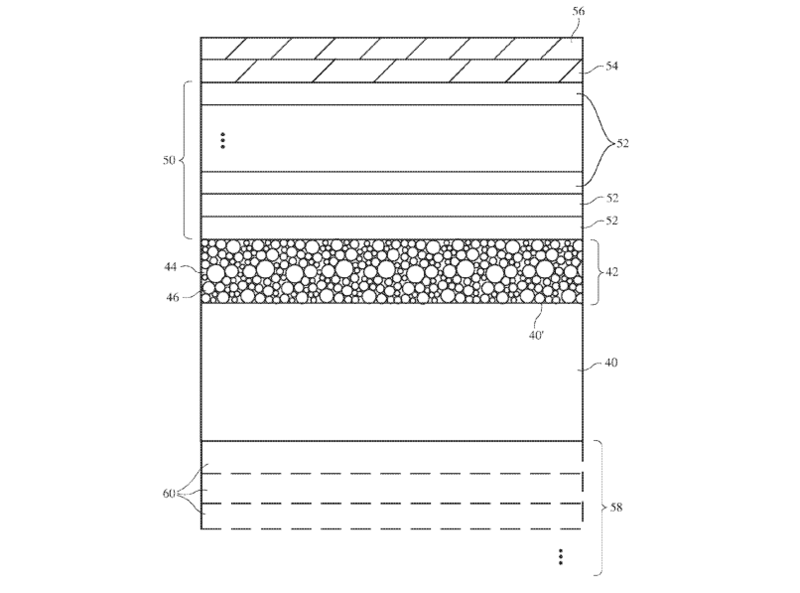 First discovered by Patently Apple, patent application 20190104625 describes a transparent protective coating that uses a polymer binder with embedded particles possibly made up of diamonds, aluminium oxide, zirconia, and quartz to create a layer that adds increased durability and scratch-resistance to the displays in Apple products. Additionally, since the patent was filed back in Q2 2018, it’s possible that Apple could be already using the tech described in the patent in current devices. However, based on the scratches that appeared on my colleague Adam’s iPhone XS, I’m going to bet that’s probably not the case. Looking toward the future, DigiTimes reported that chipmaker TSMC (Taiwan Semiconductor Manufacturing Company) recently announced the delivery of its 5nm design infrastructure, with expectations that TSMC will actually start producing 5nm chips next year. That means the next A-series chip—which are designed by Apple and manufactured by TSMC—could move up from the 7nm process used on the A12 Bionic to 5nm, potentially resulting in performance gains of up to 15 per cent. For a chip that’s already one of, if not the fastest consumer-level ARM-based processor currently available, that’s not too shabby. Finally, while it would seem to gunk up previous rumours, we should also mention a new report from Macotakara claiming that later this year, Apple will release new 6.1- and 6.5-inch iPhones with tweaked designs meant to accommodate Apple’s new triple rear camera module. Previously, rumours suggested that Apple was going to stick with the 5.8 and 6.5-inch screens found on the current iPhone XS and XS Max without too much in the way of changes to the rest of the iPhone’s body. But Macotakara claims that in order to balance out a bigger sensor and more lenses, Apple is slightly increasing the thickness of 2019 iPhones in order to reduce the final height of the camera bump. Other titbits from Macotakara’s story include a nod to previously reported rumours such as two-way wireless charging and the addition of triple rear cams. But one slightly new revelation is that Apple could include a faster 18-watt charger alongside 2019 new 2019 iPhones. That said, since this isn’t the first time we’ve heard about the iPhone supposedly getting a better power brick, that last rumour is one I’m not going to believe until its official. Regardless, these new rumours imply we could be in for a more exciting new line of iPhones in 2019 than many originally predicted. Now, Apple just has to deliver.